A new doctor finds himself with a ward full of comatose patients. He is disturbed by them and the fact that they have been comatose for decades with no hope of any cure. When he finds a possible chemical cure he gets permission to try it on one of them. When the first patient awakes, he is now an adult, having gone into a coma in his early teens. 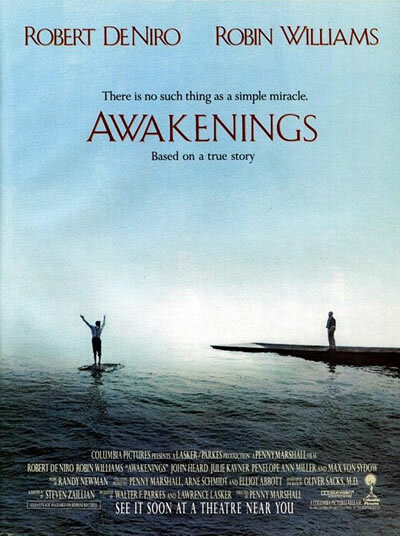 The film then details the reactions of their relatives and to the changes of the newly awakened. It was an immense project. I was trying to extract 1 decigram of myelin from 4 tons of earthworms. Yes, I was on that project for 5 years. I was the only one who believed in it. Everyone else said it couldn't be done. I know that now. I proved it. That's the Periodic Table of Elements. I can date my introduction to science by that. It's wonderful, really. It's, uh... It's the universe at its essence. You see, you have your alkaline metals. You have your halogens, your inert gases. Every element has its place in that order. You can't chance that. They're secure, no matter what. Me? No, I'm not very good with people. I--I never have been, Leonard. I like them. Maybe, if they were less unpredictable. Eleanor would disagree with you. Oh, of course. She has spoken to you about me? What did she say? That you're a kind man. That you care very much for people. Dr. Sayer, something about fruit trees. Lucy, what year is it? What year is it? It's '26, silly. I have always loved carnegia, haven't you? Dr. Sayer, did you choose this place? Why? Why? I mean, don't get me wrong, it's a nice place, but after the first hour it loses something. Miss Costello, Anthony thinks the group is bored. I thought about taking them to the Opera House. Or the museum of Natural History? Oh, no no no no, I don't think so. There's a lot of dead, stuffed things there. This film is based on a true story. Robin's character is based on Dr. Oliver Sacks. Robin will forever be grateful for happy accidents after learning he'd broken Robert De Niro's nose on the set of Awakenings. Robin felt sure his life and career were over when he accidentally struck De Niro, breaking his nose--but his moment of madness actually corrected a previous break. Robin explains, "I heard this noise and went, 'Oh Jesus,' and he got up and he was, 'I'm OK, I'm OK,' and his nose was bleeding like crazy... There was a millisecond where you went, 'F**k... dead man.' Later on he said that his doctor said that I had put his nose back in place from when he'd broken his nose on Raging Bull."